On Sunday 9th April, Deputy Mayor Trevor Lunn joined with members of The Church of Jesus Christ of Latter-day Saints to celebrate 15 years in their church-house on the Belsize Road. In addition to briefly sharing the history of the first missionaries coming to Ireland in 1840, past leaders recounted the early days of the Church in Lisburn. Brother Aaron Portis who co-ordinated and conducted the meeting, introduced past leaders Raymond Lowry, Marshall Edwards and Nigel Jackson. 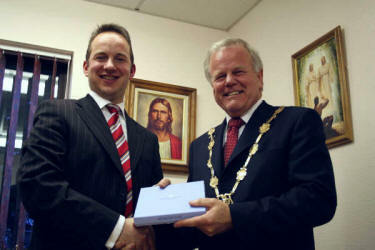 James Parker, the current Bishop of the Lisburn branch of The Church of Jesus Christ of Latter-day Saints brought the history up to the present day. Through personal stories and visuals the journey of The Church unfolded. 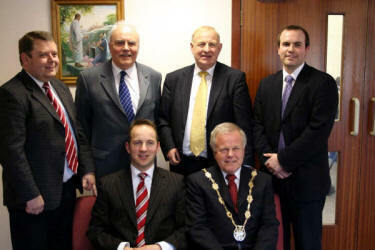 Deputy Mayor Trevor Lunn delighted the congregation with his closing remarks and shared his best wishes on behalf of Lisburn City Council. A beautiful musical interlude was provided by sisters- Rachael Parker and Karen Johnson, with Amy Portis on piano. Pictured at the 15th Anniversary of the Church of Jesus Christ of Latter-day Saints on Sunday 9th April is L to R: (seated) Bishop James Parker and Deputy Mayor Trevor Lunn. (back row) Nigel Jackson, Marshall Edwards, Raymond Lowry and Aaron Portis. Bishop James Parker presenting a token of appreciation to Deputy Mayor Trevor Lunn at the 15th Anniversary of the Church of Jesus Christ of Latter-day Saints on Sunday 9th April.